Ambassador Group and French Accor recently announced that it has reached on a management contract to co-manage Novotel Ambassador Busan, formerly Marriott Busan. Running 5 hotels in the heart of Seoul: Sofitel Ambassador Seoul, Novotel Ambassador Gangnam, Novotel Ambassador Doksan, Ibis Seoul and Ibis Myeong-dong, the Ambassador Group is now looking to expand its business in local areas with its 51 years of expertise in hotel industry. Marriott Busan, with its new official holding company, Jinsan Asset, will go under major renovation throughout its facilities and organization as well to redefine hotel culture and boom the economy in Busan. In order to transform the hotel into a successful hotel in the region, the new owner of the hotel, Jinsan Asset, has recently agreed on a management contract with Ambassador Group and Accor based on their trust in the two hotel experts' successful partnership in Korea over 17 years. The management contract with Jinsan Asset for Novotel Ambassador Busan was meaningful for Ambassador Group as it became the equal partner in the contract, not merely a launching of another Accor brand hotel in Busan. This emphasizes that Accor, a worldwide leader in hotel industry, acknowledges the reputation and expertise of its partner, Ambassador Group. Ambassador Group will actively cooperate with Accor in managing Novotel Ambassador Busan. "The management contract with Novotel Ambassador Busan is our first step in expanding our chain hotel business in local cities. Following Busan, we are planning on opening our 3rd Ibis brand hotel nearby Samsung Electronics in Suwon next July. By 2007, we expect to have 7 hotels in Seoul, Busan and Suwon with a total number of 2,200 guestrooms. By expanding our business in local cities will certainly benefit potential employees in the cities and our current guests who happen to visit those cities as they receive additional benefits. We believe it will bring a great deal of synergy in terms of developing human resources and providing better services for our guests" said a spokesman of Ambassador Group. Novotel Ambassador Busan will be officially launched on November 5, 2006 after the contract between Marriott Busan and Marriott is expired. Ambassador Group, founded in 1955, has over 51 years of history in hotel industry and had launched Sofitel Ambassador Seoul with partnership contract with French Accor in 1989. 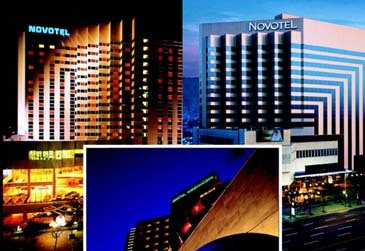 Following Sofitel Ambassador Seoul, the group opened a series of its branch hotels: Novotel Ambassador Gangnam (1993), Novotel Ambassador Doksan (1996), Ibis Ambassador Seoul (2003) and Ibis Ambassador Myeong-dong (2006). The group currently manages 5 hotels in the center of Seoul as a leading hotel group in the nation. With expertise in hotel construction and facility management the group founded its affiliate, Eujong Development Co., LTD. in February 1997 with business areas of new hotel development, hotel construction & management, renovation, system building & management, facility management & maintenance and linen laundry service. Ambassador Group, born as a hotel, has grown up as a hotel-focused group and is expanding its business in hotel industry with its 51 years of history and know-how.